Many are familiar with the Panama Canal and its profound impact on international trade and travel, however, few are aware of the great cost paid – in effort, dollars, and loss of life, in order to bring it to fruition. 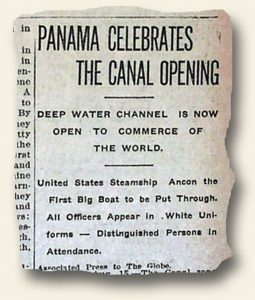 Still, after decades of suffocating labor, the canal opened in 1914. Trivia buffs may know of the Alexandre La Valley (a floating crane) – which became the first self-propelled vessel to pass from one end to the other , and others are able to recall the United States steamship, Ancon, as being the first large vessel to make the trip. Trivia Challenge: What about the impact of the canal on military interests? While the intention of the canal was one of peace, which country has the distinction of being the first to have one of its warships pass through the canal? After you’ve made your best guess, go to the August 18, 1914 Boston Evening Transcript to see if any of you are correct. If so, feel free to brag about your knowledge by contacting me through e-mail. Good luck. To-date, “0” people have guessed correctly.